Charles Minot Dole was born in Massachusetts, learning to ski as a member of the Boy Scouts. Upon turning 18 during World War I, Dole enlisted in the military, where he was given his nickname, "Minnie," due to his youthful appearance. The war ended before he finished basic training. After the war, Dole graduated from Yale and went into the insurance industry. For New Years 1936, Dole and his friend Frank Edson took their wives up to Stowe. While skiing the Toll Road in the rain, Dole fell and broke his ankle. It took some time to get help and rig up a way to pull him down the mountain on a tin sheet. Two months later, Frank Edson was killed while skiing in the Quandranglular Race on the Ghost Trail in Pittsfield, Massachusetts. After the loss of his friend, Dole started looking into ski safety. This task proved to be difficult, as many felt safety measures were dastardly. 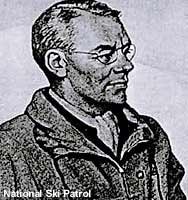 While assisting with a race on the Nose Dive at Stowe on March 7, 1938, Dole met National Ski Association president Roger Langley and discussed a national ski patrol association. In discussions the following day, Dole agreed to serve was chairman of the new National Ski Patrol System. Dole work tirelessly to develop the organization and its membership. Prior to the United States declaration of war in World War II, Dole met with United States Army Chief of Staff George Marshall, to discuss creating an American answer to the German and Italian ski troops. Marshall tasked Dole with forming the group, which would be known as the 10th Division upon being activated in 1943. Deployed to Italy in 1944, the division was renamed the 10th Mountain Division. Dole continued as head of the National Ski Patrol System until 1950, when Ed Taylor took over. In 1960, Dole consulted for and was a shareholder in the 1961 Thunder Mountain development, led by fellow nutmeg state resident Art Parker. Later known as Berkshire East, the ski area has a trail named in Dole's honor. In 1965, Dole released is autobiography, Adventures in Skiing. Charles Minot Dole died in March of 1976.